The Rebel Sweetheart. : The #NationalPamperingDay Experience. Stress has been my best friend for the past few weeks. I had writing deadlines to meet, business transactions to complete, Yue's summative exam's to prepare for (if you're following me on Instagram then you know how OC I am when it comes to reviewers and exams), and social media projects to accomplish. To make things worse, Yue got sick which entailed sleepless nights, several trips to the doctor, and missing school for a few days. Pretty taxing, right? 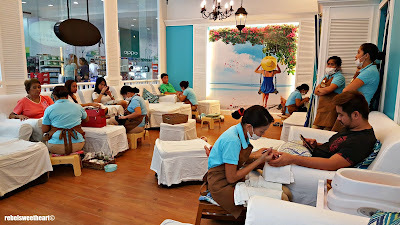 And so when I received the invite to partake in this year's National Pampering Day, I said yes in a heartbeat. 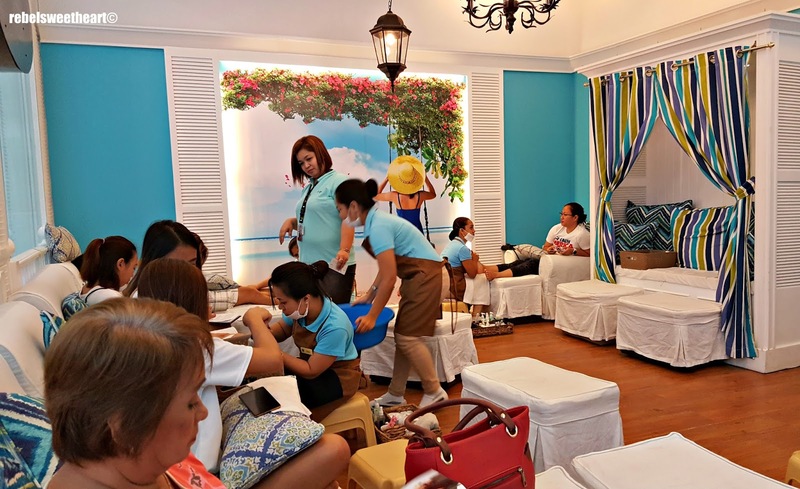 Held last October 17, the nationwide event was hosted by Nailaholics, the country's most popular nail salon and spa. 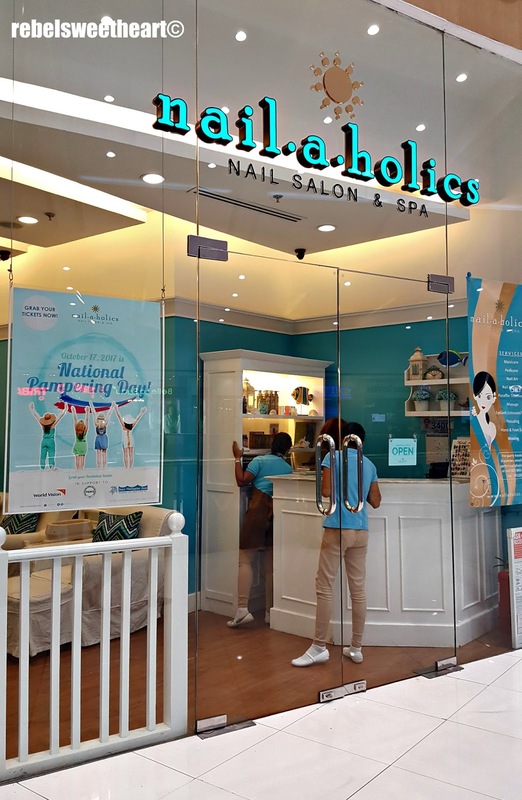 With the aim to give every hardworking Filipino a well-deserved treat, all Nailaholics branches in the country offered free services from 10 am to 1 pm. 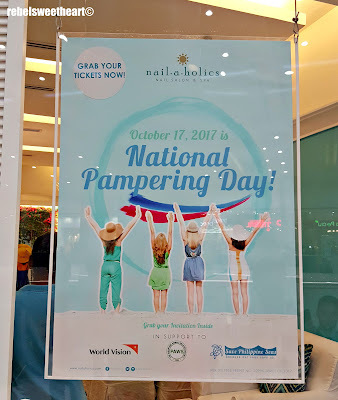 October 17, 2017 is National Pampering Day! The very first National Pampering Day was held last year, and was widely-received by the public. As such, Nailaholics decided to run a sequel and make it more meaningful by adding more options to the free services that they offer. 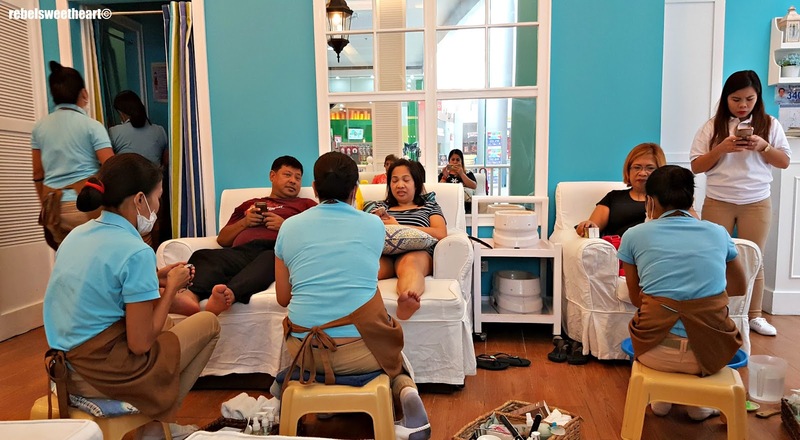 This year's event now had a foot spa and a foot massage, as well as the free manicure that had been a big hit the previous year. Anticipating a huge crowd of patrons, I visited Nailaholics SM San Pablo as soon as the mall opened. True enough, there were already plenty of customers when I arrived. Most of the seats inside the salon were already occupied, and almost all of their nail technicians had customers to attend to. Miss Jen, the branch manager, ushered me to an empty seat in the corner. She asked me which of the free services will I be getting (foot spa, of course) and was a bit apologetic that I had to wait for a few minutes for my turn. I told her that I don't mind the wait, and it was nice to see that many customers came to the event despite the nationwide transportation strike. Miss Jen making the rounds, checking if each customer is satisfied with their service. 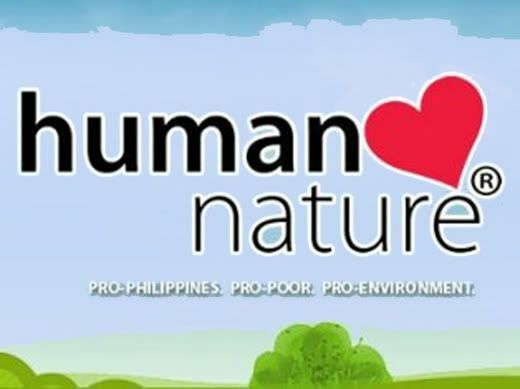 You see, for every customer who will avail of the free service, Nailaholics will donate Php 10 to a charity of the customer's choice - World Vision for the rehabilitation of Marawi City, Save the Seas to help protect the country's marine and coastal resources, or PAWS to support their campaign of adopting stray dogs. More customers meant more donations for the charities mentioned. After a few minutes of waiting, my turn finally came. Angel was my nail technician for the day, and as she sat in front of me to scrub the callus off my feet, I realized that I have not had a foot spa since my last trip to Seoul! And that's already half a year! 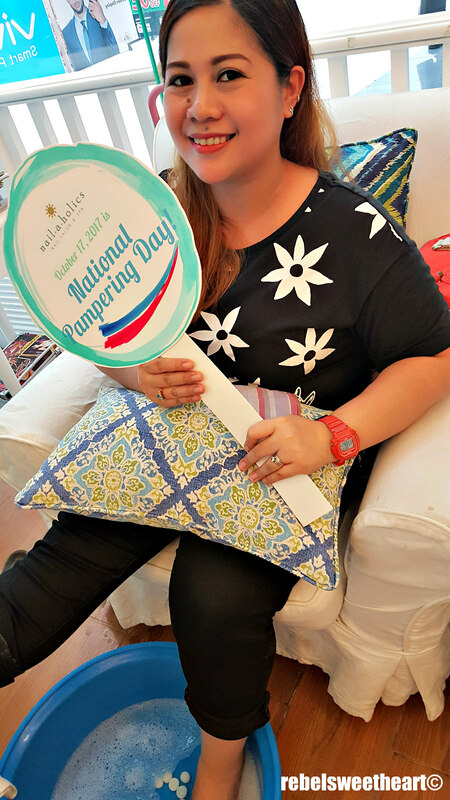 Getting a well-deserved and much-needed pampering on National Pampering Day! My nail technician did a good job of exfoliating my feet and massaging my legs, asking me from time to time if the heat of the water is okay, if the scrubbing tickles, or if the pressure on my legs and feet were just right. She gave me the most relaxing foot spa I have had in years that I will most likely book her for my next appointment at Nailaholics. This event looks so amazing and relaxing. I didn't even know there is National Pampering Day, what a great idea! Wow! It looks like a great and nice pampering experience for everyone. Such a brilliant idea. I think I need to treat myself like this.